Myocardial ischemia and myocardial infarction are both conditions defining the failing condition of the heart muscle. While myocardial ischemia is characterized by a decrease in blood supply to the heart tissue which leads to chest pain or angina pectoris, myocardial infarction is the end point of this ischemia that results in death of heart tissue due to absence of blood supply. Myocardial infarction is what is commonly termed as a heart attack and is often the result of a prolonged and untreated myocardial ischemia. 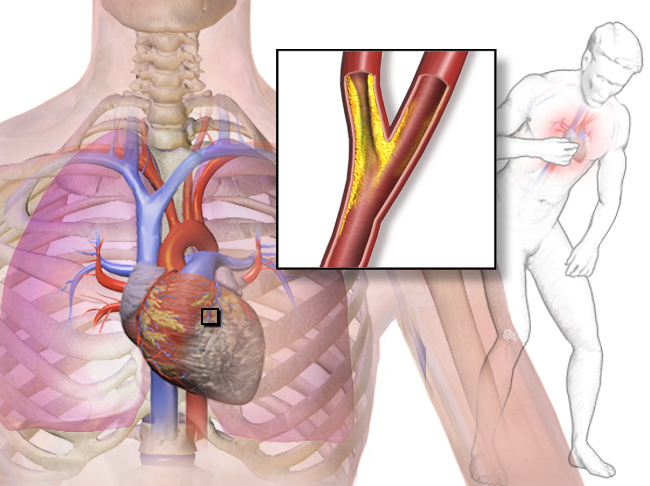 Coronary artery disease (CAD) is the commonest cause of myocardial ischemia because it is produced due to a reduced blood supply and these arteries are responsible for regulating the blood supply to the heart. In this condition, the arteries become narrow and lose their elasticity due to collection of cholesterol plaques inside the arterial wall, thereby reducing the blood flow to the heart muscle itself. This cholesterol aggregation is termed as atherosclerosis. Blood clots obstructing the blood flow through heart’s arteries can also lead to myocardial ischemia. Coronary artery spasm is a condition where the muscles within the walls of the arteries supplying the heart tighten thereby reducing the blood supply to heart. In addition to the above causes, there are plenty of other risk factors which have a major impact in the development of myocardial ischemia like smoking, chewing tobacco, diabetes mellitus, hypertension, increased cholesterol levels, obesity, lack of physical exercise and a strong family history. All the signs and symptoms of myocardial ischemia are seen in case of myocardial infarction. Along with these symptoms, it can present with few other symptoms. In case of ischemia, patient suffers from a feeling of chest heaviness, pain or pressure especially on the centre of the chest, or left side and the pain can be felt even in neck, jaw, shoulder or left arm. In rare cases, it is also seen on the right side, with a sensation of nausea, vomiting and breathlessness on slightest exertion. In case of ischemia, the patient may present with excessive sweating, fatigue, palpitations, sensation of heartburn and light headedness along with all the above symptoms. Sometimes it may so happen that the patient may not complain of any of these symptoms and suffer a ‘silent heart attack’ which is seen in case of patients suffering from diabetes mellitus since a long time. If the ischemia is too sudden and severe, leading to instant infarction and death soon after, within a matter of minutes. In case of ischemia, a coronary angiography can be done to detect any defect in coronary arteries that supply blood to heart that may be the cause of ischemia. ECG can show changes due to insufficient supply of blood to heart tissue. Cardiac stress test can be done to induce the symptoms as well as see changes in electrocardiogram caused due to this stress on the heart tissue. In case of myocardial infarction, the ECG will show different set of changes prodcued due to infarction. Levels of cardiac biomarkers help in diagnosing an ongoing heart attack or myocardial infarction. When the blood flow is restored in case of ischemia, the pain decreases within a few minutes and there is no permanent injury to heart. This condition can be treated by regulating the blood supply to the heart with a medical line of treatment depending on the cause of the problem whereas in case of an infarction, the blood flow is minimal or absent, and the pain continues for longer duration and the heart muscles dies if immediate treatment is not received. Hence, it is advisable to take prompt steps when the person is known to suffer from myocardial ischemia to prevent it from progressing to a full blown heart attack. rachita. "Differences Between Myocardial Ischemia and Myocardial Infarction." DifferenceBetween.net. December 19, 2014 < http://www.differencebetween.net/science/health/differences-between-myocardial-ischemia-and-myocardial-infarction/ >. Highly unprecise article in both wording and underlying science. Most of the material presented here is simply not correct. Source: I’m a medical student. Could u please advice me reference book or it will be great if u can mail me copy of the same . My father is with triple vessel disease. The part through LCx is of ischemic muscle. Will angioplasty in LCx help the revival of ischemic muscle ?